So you need multiple channels, battery power, outstanding accuracy, and the ability to read many different sensor types—but you don’t need all the power of a 1 ppm Super-Thermometer. We have the answer for you. Fluke Calibration’s 1529 Chub-E4 Thermometer gives you four channels, three major sensor types, lab-quality accuracy, and a ton of great features, all at a price you’ll love. The Chub-E4 has four inputs for reading four different sensors simultaneously, and we’ll configure those inputs in any of three different ways according to your preference. Choose four channels of thermocouple inputs, four channels of PRT/thermistor inputs, or two channels of each. With this thermometer, reading thermocouples, PRTs, and thermistors accurately from the same device is no problem. 100-ohm, 25-ohm, or 10-ohm PRTs and RTDs are read using ITS-90, IEC-751 (DIN), or Callendar-Van Dusen conversion methods. Typical accuracies include ±0.004 °C at –100 °C and ±0.009 °C at 100 °C. Thermistor readings are converted using the Steinhart-Hart polynomial or standard YSI-400 curve and are as accurate as ±0.0025 °C at 25 °C with resolution of 0.0001 °. PRTs and thermistors connect easily to the 1529 using Fluke Calibration’s patented mini DWF connectors, which accept bare wire, spade lug, or mini banana plug terminations. Thermocouples connect using standard or miniature terminations. Measurements are taken each second and can be taken simultaneously or sequentially. A special high-speed mode allows measurements on one channel to be taken at the rate of 10 per second. If you think three sensor types and four inputs sounds versatile, wait until you see the display panel on the Chub-E4. Displaying measurements in °C, °F, K, ohms, or millivolts and choosing temperature resolution from 0.01 to 0.0001 are just the beginning. You can also select any eight items from our long list of displayable data fields to view on-screen. Choose statistical functions such as averages, standard deviations, and spreads; choose probe information such as probe type and serial number; choose T1–T2 functions using inputs from any two channels; or choose utility functions such as the date, time, and battery power level. You can even save up to 10 screen configurations for easy recall. The push of a single front-panel button also brings up a simple menu system to easily guide you through all the internal setup and memory options of the 1529. Probe coefficients, sample intervals, communication settings, password settings, and a host of other functions are all easily accessible. The memory and communications capabilities of the Chub-E4 make it perfect for benchtop thermometry, on-site measurements, lab calibration work, and remote data logging. 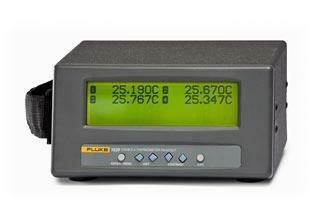 Optional software packages from Fluke make this one of the most powerful thermometers on the market. With battery power and memory to store up to 8,000 measurements (including date and time stamps) at user-selected intervals, the 1529 has plenty of data logging capability. Store 100 individual measurements or any number of automatic log sessions (up to 8,000 readings), each tagged with an identifying session label. Fourteen different logging intervals may be selected, from 0.1 second to 60 minutes. With Fluke Calibration’s 9935 LogWare II (page 85), data may be quickly downloaded to your PC for complete graphical and statistical analysis. Separate log sessions may even be automatically downloaded to separate files based on session labels. With this software, the 1529 can even be used for real-time data logging. Log four channels at once directly to your PC with virtually no limit to the number of data points you take. You can analyze data, set alarm events, and even set delayed start and stop times. With MET/TEMP II software, the Chub-E4 may be integrated into a completely automated calibration system. Use one input for your reference thermometer and calibrate up to three other thermometers automatically (see page 81). An RS-232 port is standard on every unit. An IEEE-488 port is optional. Did we forget some aspect of versatility on this thermometer? No! The 1529 runs on AC power from 100 to 240 volts, DC power from 12 to 16 volts, or off its internal nickel-metal-hydride battery for eight hours between charging. The standard battery charges in less than three hours and lasts through 500 charge/recharge cycles. If you want to rack-mount your Chub-E4, we’ve even got a rack-mount kit for you. This unit fits on your benchtop, in your instrument rack, and even in your hand. 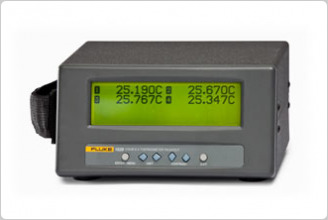 Of course, all the reference thermometers you might need for your 1529 are available from Fluke, including secondary standard PRTs, standard thermistors, and noble-metal thermocouples. Carrying cases and even a serial printer for direct printer output are also available. We’ve said it before and we’ll keep saying it: Fluke Calibration simply makes the best thermometer readouts in the world. No one else gives you a comparable combination of accuracy, versatility, productivity-enhancing features, and price. No one. Get a Chub-E4 and just enjoy everything it’ll do for you. You’ll love it. 5 KΩ to 200 KΩ: ± 100 ppm of rdg. Calibration Accredited resistance and voltage calibrations are provided. System Verification, PRT with Readout, Accredited. Choose two temperature points, extra points at additional cost. Available temperature points are –197 °C, -80 °C , –39 °C, 0.01°C, 30 °C, 157 °C, 232 °C, 300 °C, 420 °C, 500 °C, 660 °C. System Verification, Thermistor with Readout, Accredited. Choose two temperature points; extra points at additional cost. Available temperature points are -30 °C, -20 °C, -10 °C, 0 °C, 10 °C, 20 °C, 30 °C, 40 °C, 50 °C, 60 °C, 70 °C, 80 °C, 90 °C, 100 °C. System Calibration, PRT with Readout, Accredited. Choose PRT temperature range for the calibration. Available temperature ranges are –200 °C to 500 °C, –200 °C to 420 °C, –80 °C to 420 °C, –40 °C to 420 °C, –40 °C to 232 °C, 0 °C to 420 °C. Choose thermistor temperature range for the calibration. Available temperature ranges are 100 °C span (6 points over span), 60 °C span (7 points over span), 100 °C span (11 points over span).